Grace Jones scared me as a kid and not in a bad way. Her brute strength and larger then life persona overwhelmed my senses. In fact, I thought her fierce image and wild album covers were unworldly. Grace Jones was more powerful than anybody I knew -- man or woman. James Bond didn't have a more formidable foe. That's what I felt as a little boy growing up in Montreal and that's how I still feel as a man in my 40's -- especially after catching the World Premiere of her new documentary, Bloodlight and Bami, at the opening of TIFF last night. Directed by Sophie Fiennes (The Pervert’s Guide to Ideology), the film follows the 69 year old singer on tour and captures charming moments of her family reunion in Jamaica. We see much of the Grace that we know and love on stage, but offstage, we're treated to a stripped down version of the iconic performer. Gone are the flamboyant hats, androgynous costumes and dynamic make-up. In Bloodlight and Bami, we not only see Jones in her civilian-wear, we also get to see her as a loving daughter and sister. Interestingly, when she communicates with her family, she drops her English/American accent and code switches to Jamaican patois. We get a strong sense that these are genuine family moments and that Jones is not performing for the camera. But when she does perform, it's hysterical. After having trouble opening an oyster, she casually says, "This is a tight muscle. I wish my p#ssy was this tight." Another funny moment happens when she shares her disgust for a tacky stage where she has to perform with all-female dancers. "I feel like a lesbian madame in a whore house!" Jones attended the premiere and acknowledged that she's always been in control of her image, but put her trust in Fiennes with displaying her less than flattering side. "At times I felt that my tummy was a bit fat," Jones told the audience. "Ahh, I told myself, let your vanity go for once. It was freedom. It made me a stronger person." 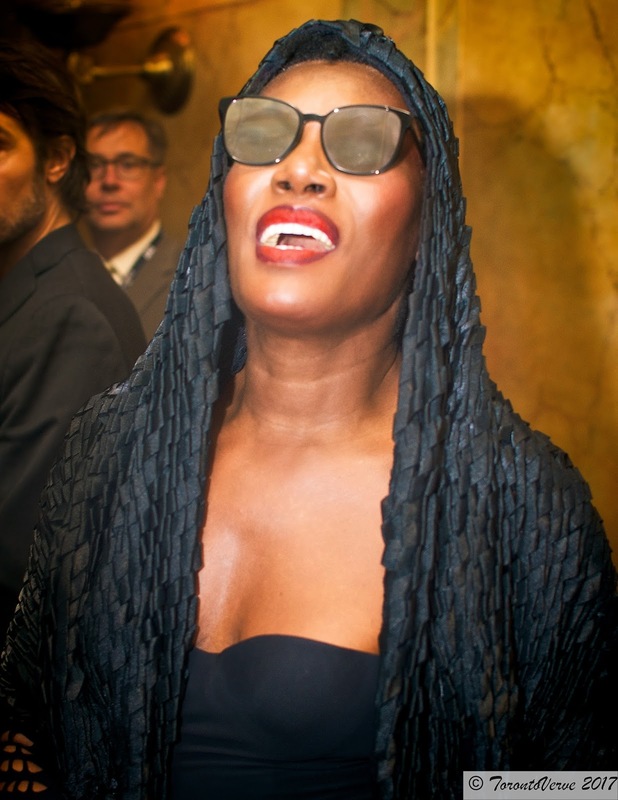 Who thought Grace Jones needed to be stronger? Bloodlight and Bami has no scheduled release date.